You recognize that your child doesn’t seem to be getting the test scores and grades that you think they should. They study, they seem to know the material when you talk to them, but for some reason their test scores and grades don’t seem to match…what gives? 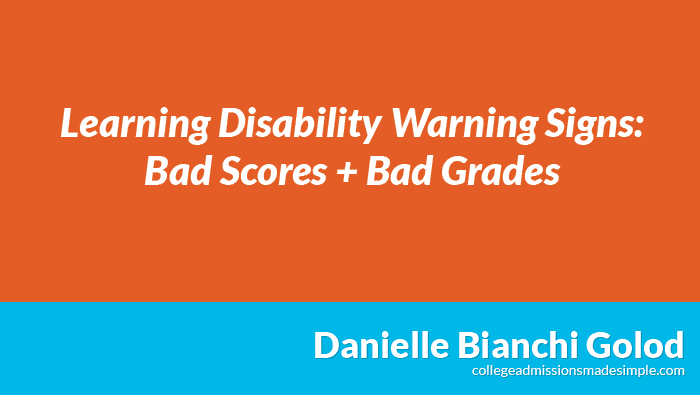 While bad test scores combined with bad grades doesn’t mean that your child has a learning disability…it might be time to investigate to make sure that one is not being overlooked at home or at school. There are many great resources online to help learn more about the specific learning and processing disorders that affect our children. A great starting point is the Learning Disabilities Association of America website. They have a great primer on the most common learning disabilities that only take a few minutes to read. They are chock full of warning signs and many times you will find it sounds like they are writing about your child. A great place to start is their New to Learning Disabilities page. If you find that there are one or more disorders that you think your child might be working with, the next step is to contact your child’s school counselor and set a time to review what services the school may offer to help diagnose a potential learning disability. For some learning disorders, you may be able to contact your child’s pediatrician to have him or her evaluated. This may be the least expensive option as using a specialist can be pricey. If your child is diagnosed with one or more learning disabilities it might make sense to find a specialist that you and your child are comfortable with. This can be a lot for both parents and children to make sense out of. Having a trusted advisor to help guide both of you can be invaluable. Testing accommodations are available for many different learning disorders. Many other types of accommodations and modifications may be available to your child from your school as well. These should be discussed with your child’s school counselor or learn more about testing accommodations here. As parents we can sometimes doubt ourselves. Don’t. If you feel there might be a problem or a challenge, pursue it. There are many resources available today for students who are working with different learning challenges. It can make a huge difference in your child’s quality of life as well as your family’s. If you have any questions please feel free to ask.